Gail Simpson, M.D., and Chris Ouellette, RN, Nurse Epidemiologist, will present a lecture on “Infection Control”. They will; 1) Discuss pertinent safety, infection control, and quality improvement practices, and 2) Explain the diagnosis and treatment of acute illness in the hospital setting. The conference will take place on Tuesday, February 5, 2019, at noon, in Nichols Auditorium. Lunch will be provided and Category 1 & 1-A CME will be available. If you would like to view this lecture online, please contact the CME Coordinator, Christeva Vazquez at cvazquez1@cmhshealth.org or 805-948-5638 to be added to the webinar list. Be mindful of mobile device use in the presence of patients. Use texting for non-urgent communication that relates to patient care or hospital business (not for personal use). Patient specific details (e.g. name, room number) available inpatient pick list. Use approved abbreviations so the receiver understands the intended message. Do not text or accept texted orders. Ensure a system acknowledgment is received for each communication. Do not send extra acknowledgments via text. If a response is expected and not received (including communication to off duty users)escalate communication to a telephone call following the proper chain of command. When extensive details or clarification is needed. When urgent action or response is needed. For clinical emergencies or as a replacement for rapid response or code blue. Broadcast and group texts should only be used by leadership designee to communicate the same information to multiple users simultaneously. VenturaCare Partners Outpatient Palliative Care – A Letter from Chuck Pankratz, M.D. I am pleased to inform you that after a brief period of restructuring VenturaCare Partners APC has reopened in our new location! We have two Palliative Care physicians and are scheduling patient appointments Tuesday through Friday. 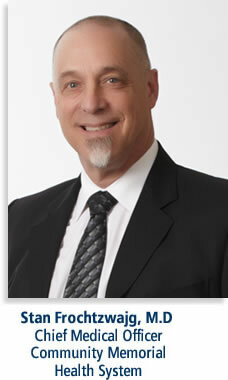 Dr. Jerry Maryniuk will provide clinical services on Thursday and Friday. Dr. Maryniuk has 30 years of experience as an emergency room physician. He has been a part of the Palliative Care team at Community Memorial Hospital since 2015. He is excited to transition to our outpatient Palliative Care clinic. Dr. Christina Matts will provide clinical services on Tuesday and Wednesday. Dr. Matts completed her fellowship at the University of Utah in Hospice and Palliative Medicine. She also practiced as an emergency room physician at Los Robles Hospital. We are excited to have Dr. Matts join our team. I continue to act as the Palliative Care Medical Director and oversee the outpatient Palliative Care clinic. I am available to talk with you about any of your patients who may benefit from an outpatient Palliative Care consult. I will contact you in the near future by phone to answer any questions you may have about our clinical service. The support staff at our clinic would also like to reach out to your office to share information and address any questions. Multi-factor authentication simply means that you are using more than one means to prove your identity. Most commonly this is described as something you know (password), something you have (mobile phone), or something you are (biometrics). Many organizations protecting sensitive information have implemented multi-factor authentication to protect their customers. For instance, online banking will require the use of a username and password as well as a code sent to your phone the first time you log in. Without this second factor, any criminal that gains access to your password would have full access to all of your information. As many of us use the same password across multiple sites, this problem becomes amplified. Please find below some additional reasons to enable multi-factor authentication wherever possible. Identity theft is an easy, low-risk, high-reward type of crime and a threat to all businesses. It is the fastest-growing type of crime and is now more profitable than drug-related crimes. Weak or stolen user credentials are hackers’ weapon of choice, used in 95 percent of all Web application attacks. Headlines tend to belong to the household-name companies, but they are not the only companies being targeted. Of all targeted attacks, 31 percent are aimed at businesses with fewer than 250 employees. Password theft is constantly evolving as hackers employ methods like keylogging, phishing, and pharming. Cybercriminals do more than merely steal data. With the rise of ransomware, they destroy data, change programs or services, or use servers to transmit propaganda, spam, or malicious code. We have a critical shortage of injectable Thiamine. It is currently unavailable and we have #32 vials left in the hospital. Expected recovery is February 7-11th. We are requesting that medical staff help us reserve these remaining 100 mg vials for patients with known or suspected Wernicke Encephalopathy or BeriBeri syndrome, and limit doses in these patients to no more than 200 mg q8h. Oral thiamine is still well stocked and should be utilized for anyone without the above indications, including replacement in patients with Alcohol Use Disorder. An injectable multivitamin provides 6 mg of thiamine if the patient is on TPN. This entry was posted in MSV. Bookmark the permalink.